I have so many thoughts swirling around in my head that it seems (and is) impossible to pick one and write. School starts in two weeks, I’ve started looking for a new job (come May) and soon M will be looking for a new job. We are tossing ourselves in to the wind with no real outcome in mind. While it is 78% exciting, there is still that 22% of me that is scared. But for right now I am trying to put that out of my mind and enjoy the last two weeks of summer. During my last two week there will be veggies, and lots of them. I feel that if I don’t eat giant plates of veggies during the summer, something is wrong. I roast/grill them and call it a meal. Sometimes I have a little hummus to dip them in or turn them in to a giant salad but one thing is always constant: veggies. This meal comes together quickly and really is a fly-by-the-seat of your pants kind of meal. Use whatever veggies you have on hand, add cheese, turn them in to tacos, get creative! This is a rough recipe because giving an exact amount for the veggies seemed arbitrary. Simply use what you have on hand! Also, the addition of cheese would be delicious- try feta, goat, or a little queso fresco. Anywhere from an hour up to a day** before, cut up veggies in to rough 1″ pieces. Whisk together marinade. 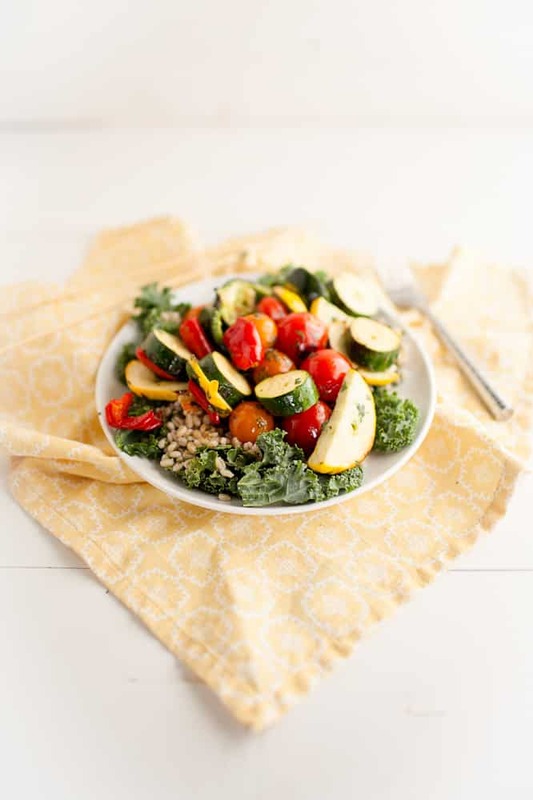 In a large dish, like a 9×13 pan, toss together veggies and marinade. Since I don’t give you exact measurements on the veggies- you may have to make adjustments to the marinade, just whip up a little more if need be. Cover and refrigerate until ready to use. One hour before, soak up to 6 wood skewers in water. In a pot, cover barley with two inches of water. Bring to a boil, reduce to heat slightly, and let cook until barley is tender (but will still be slightly chewy.) Set aside. While kabobs are on the grill. Roughly chop kale. Toss kale and cooked barley with the left over marinade. 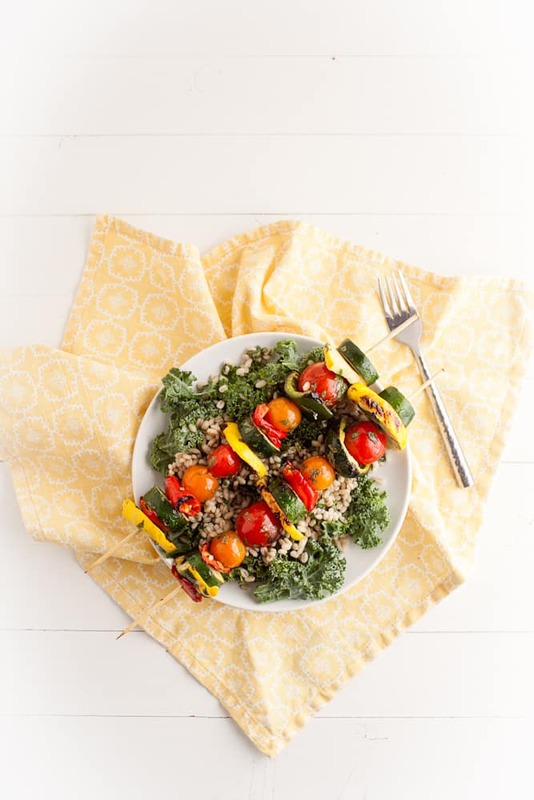 Place on a plate and serve with 1-2 veggie kabobs. **I usually prep the veggies the night before and let it sit until the next day. i teach two and like you, have two weeks left of summer. barely enough time for all the things i want to pack in it! good luck with all your plans… and again, congratulations on your engagement! all the best! I find that those moments where I’m scared of the unknown often lead to some of the most exciting times. I predict wonderful things for you and your family! 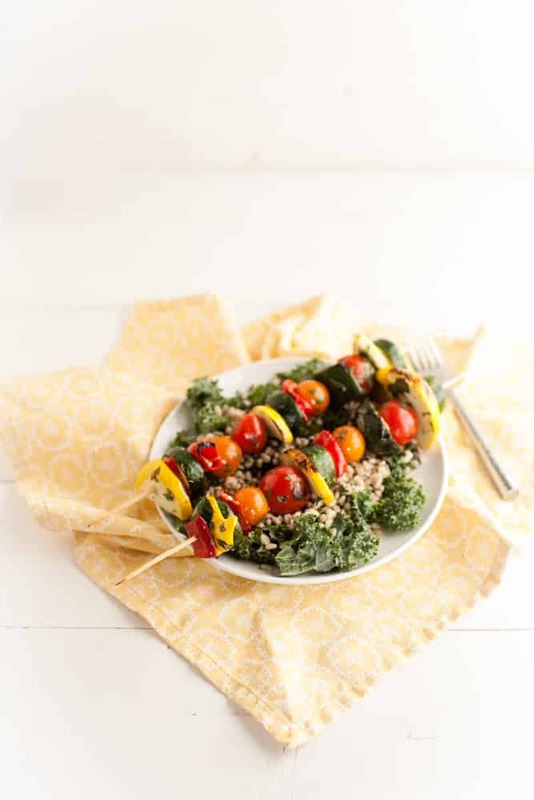 These kabobs and salad look great! I didn’t make the entire recipe, but used the marinade to make veggie kabobs for a summer BBQ with friends. Used zucchini, yellow pepper, onion, cherry tomatoes, and mushrooms and followed the marinade recipe as is. They were a hit! Definitely saving this recipe for many BBQs to come, thanks so much!